CAUTION – these are old, old Ads! These are old company ads. This was before they had commercial 3-color printing. Nowadays color printing is normal and not too many things are printed in black and white except some types of ads and newspaper printing, although color is often in some newspaper printing of images. The first widely reproduced image printed using the three-color process, by William Kurtz (January 1893)[/caption] Cyan, magenta, and yellow are the three basic colors used for color reproduction. When these three colors are variously used in printing, the result should be a reasonable reproduction of the original, but in practice this is not the case. Due to limitations in the inks, the darker colors are dirty and muddied. To resolve this, a black separation is also created, which improves the shadow and contrast of the image. Numerous techniques exist to derive this black separation from the original image; these include grey component replacement, under color removal, and under color addition. This printing technique is referred to as CMYK (the “K” stands for Key, a traditional word for the black printing plate). 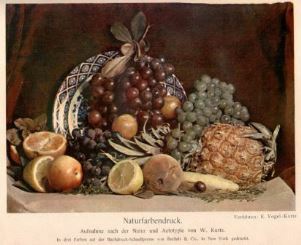 The first widely reproduced image printed using the three-color process, by William Kurtz (January 1893). Click image to enlarge. Today’s digital printing methods do not have the restriction of a single color space that traditional CMYK processes do. Many presses can print from files that were ripped with images using either RGB or CMYK modes. The color reproduction abilities of a particular color space can vary; the process of obtaining accurate colors within a color model is called color matching. Inks used in color printing presses are semi-transparent and can be printed on top of each other to produce different hues. For example, green results from printing yellow and cyan inks on top of each other. However, a printing press cannot vary the amount of ink applied to particular picture areas except through “screening,” a process that represents lighter shades as tiny dots, rather than solid areas, of ink. In process color printing, the screened image, or halftone for each ink color is printed in succession. The screen grids are set at different angles, and the dots therefore create tiny rosettes, which, through a kind of optical illusion, appear to form a continuous-tone image. You can view the halftoning, which enables printed images, by examining a printed picture under magnification. Most recently, computer to plate (CTP) technology has allowed printers to bypass the film portion of the process entirely. CTP images the dots directly on the printing plate with a laser, saving money, and eliminating the film step. The amount of generation loss in printing a lithographic negative onto a lithographic plate, unless the processing procedures are completely ignored, is almost completely negligible, as there are no losses of dynamic range, no density gradations, nor are there any colored dyes, or large silver grains to contend with in an ultra-slow rapid access negative.